Knowledge. Advance your market intelligence, skills, and business value at high-impact conferences, regional meetings, and webinars. As a member, you receive discounted registration rates to these events (and free access to webinars). 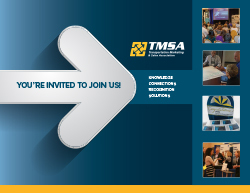 In addition, you receive a complimentary subscription to our weekly e-newsletter, Moving Forward, and access to best practices and other resources through the TMSA Members Only website. Recognition. Gain professional recognition through such programs as the Compass Awards, Marketing Executive of the Year, Sales Executive of the Year, and by volunteering as an industry leader. Solutions. Sharpen your marketing and sales savvy through dynamic forums focused on information exchange and best practices. Gain from peer-to-peer sharing of best practices, "Ask The Expert" forums, case studies, TMSA Affinity and Discount Programs, the TMSA Job Finder, and TMSA Resource Guide.